Everything from your pharmacy decor to your merchandise mix is carefully planned and executed with the best of intentions — and you know what they say about good intentions. It’s entirely possible to come up with a product mix that’s a bit behind the times, or that just doesn’t resonate with the demographics you serve. While it’s possible to expand your audience and your market, you’ll have a difficult time doing that if you don’t first understand who they are and what they need. Take the time to listen and learn, and they’ll repay you with their their business. Another upshot to understanding your customers is that you’re better able to serve them. Let’s face it: competing on price isn’t always possible, and often isn’t desirable; it’s a race to the bottom, especially since thinner margins can gut your business. Taking the time to tailor your offerings, serve your customers, and provide top-notch service can help you compete on loyalty even when you can’t compete on price. Wasted space translates to lost profits, and we find wasted space nearly everywhere we look. 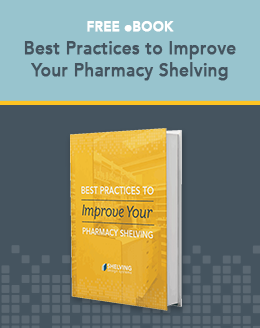 Pharmacy workflow processes are often hampered by poor layouts that contribute to improper stock levels and wasted motion, but our sales floors often fare little better. Make the most of every square foot by using the right pharmacy shelving and fixtures, and by building in a degree of flexibility so that your business can tailor everything from your stockroom to your sales floor layout depending on the season and customer demand. A follow-on effect of proper shelving and merchandising is the ability to better stock your store. Use your inventory management system or your store’s POS to track stock levels against sales, taking smaller deliveries more often so you can keep merchandise moving instead of gathering dust. Not only will this save you money, it also saves you the headaches of finding a box in a dusty corner of your stockroom that contains merchandise that passed its sell-by date in 1997. Each of the steps above will fail if your staff isn’t on board. Even when they’re coming to work every day putting in their best effort, a lack of training can mean that they’re not assisting you in market research, inventory management, and customer service. You can also take a cue from many other retail establishments and train your customers to upsell by adding items that complement existing purchases (like pocket-sized tissues to go with cough drops, or hand sanitizer to go with cold medication). When we talk about relationship-building, we’re speaking from experience. Pharmacists across the southeast trust Shelving Design Systems because of the variety of solutions we offer, true; but they also trust us because we go beyond shelving to offer a range of design and customization options that ensure we deliver pharmacy solutions, not just products. That takes years of experience, but it also relies heavily on the relationships we work hard to build with each individual client. To see the difference that makes every day, reach out for a consultation.